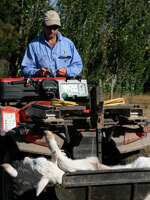 Paringa Livestock is an elite genetic supplier of bulls and rams for Australian beef and lamb producers. Through the use of worlds best practice management and backed with science, we strive to give our clients the competitive edge they require to be profitable in all markets and environments. 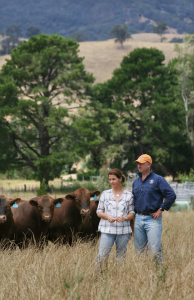 Paringa Livestock, a family run business is centered around a passion for animal breeding. Using latest technologies and proven genetics from around the globe, breeders can have confidence their progeny will perform. Backed by decades of knowledge and experience, Paringa Livestock is the number one source for your red meat genetics. We aim to keep things simple with a highly disciplined approach to tight breeding using only proven genetics. We are unrelenting on producing the best red meat genetics for Australian beef and lamb producers. Our Charolais and Red Angus rank in the top 5% for most traits, just check out how they compare on the Charolais and Red Angus websites (see links). Paringa Field Day At Yea, with Christine Jones. Among soil specialist Christine’s Jones supporters are Tom and Olivia, whose adherence to her principles proves beneficial particularly to get through long dry spells. Christine Jones is an internationally renowned groundcover and soils ecologist who has worked extensively with innovative landholders to implement regenerative land management techniques that enhance biodiversity, increase biological activity, sequester carbon, activate soil nutrient cycles, restore water balance, improve productivity and create new topsoil. The most meaningful indicator for the health of the land is whether soil is being formed or lost, according to Dr Jones. The Lawson’s have applied biological farming practices for around 8 years on their farm at Yea where they run Charolais, Red Angus and Hybrid seed stock cattle. “We have consciously reduced our chemical inputs whilst using natural based fertilizer each year instead of the traditional NPK. Noticeably we have seen a reduction in animal health problems and increase in nutrient density and growth in our pastures” Olivia said. “Our commitment to a best practice holistic approach has included fencing all waterways, large scale revegetation and fencing off remnant areas. We also try to apply rotational grazing to pastures and prefer longer term productive perennials rather than short term grasses whilst maximising ground cover at all times. Consequently, our organic carbon content has increased by 2% across the farm. “If productive soil continues to be lost, debates over the optimum enterprise mix, pasture species, fertilizer rate, percentage of trees, or any other “detail” over which we seem to argue endlessly, are irrelevant”. Dr Jones added, “to improve the quality of the soil, it must always be covered with plants or plant litter and groundcover should be initially rested from grazing. Then ideally the groundcover should be grazed or slashed periodically.” Cell grazing is good for producing green leaf and returning carbon to the soil, with Dr Jones describing every green plant as a “solar powered carbon pump”. Soil conditions must enable soil organisms to flourish so Dr Jones said producers must think carefully about the effects any drenches, pesticides, herbicides and fertilizers used. Dr Jones said a composty smell indicates high levels of biological activity, particularly fungi. The activities of beneficial soil microbes are important for the formation of soil aggregates which give its structure, improve porosity and water-holding capacity. When new topsoil is forming, it will have better structure and will contain more air and more pore spaces than degraded soil, so the bulk density will be less. Improving the level of soil carbon will hold the water where it falls. If water runs off rather than going into the soil it will take the nutrients with it. Plants need to grow to a certain size to develop a good root system, and then be grazed to pump carbon back. Keeping pasture short degrades the soil. “Healthy root systems are essential for maintaining the soil foodweb of microorganisms that make nutrients and minerals available to plants, and hence to stock.”. For more information on Dr Christine Jones see www.amazingcarbon.com and www.carboncoalition.com.au. More information on the Lawson’s breeding program and current bull sale information www.paringalivestock.com.au.